It seems like D-Link has been on a role of late with their 2011 line of products hitting the markets. A few months ago D-Link announced the availability of the D-Link DCS-932L Day/Night Network Camera (Be on the lookout as I plan to have my full review posted within the week ), and not too long after was the announcement of the D-Link DIR-651Wireless N 300 Gigabit Router. Well, next up is the just announced D-Link Wireless N Dual Band MediaBridge, the DAP-1513. If you know me, I am a big fan of going wired throughout the house. However, I realize that for many this is not possible based on factors such as cost and location. In a case like this a device such as the D-Link MediaBridge may be the answer. The MediaBridge allows you to connect up to four devices wirelessly to any wireless home network via Wireless N (perfect example would be connecting to the D-Link DIR-651 Router). Since the MediaBridge is Dual Band, you can prioritize how you plan on using the MediaBridge, opting to go with the 5GHz band if streaming video or online gaming is your priority. The DAP-1513 has an MSRP of USD 119.99, but doing a quick search on the web I was able to fund for under USD 90. Read below for more information as well as the full press release. FOUNTAIN VALLEY, Calif. – May 25, 2011 – D-Link® today announced its new Wireless N Dual Band MediaBridge® (DAP-1513), allowing consumers to easily expand a home network by wirelessly connecting up to four devices. Equipped with 802.11n technology, 2.4 GHz and 5GHz dual-band, for an enhanced media experience and a four-port Fast Ethernet switch, the DAP-1513 is ideal for connecting a wide range of network-ready devices for streaming HD videos, playing online games and sharing music, photos, movies, and more within a home network. 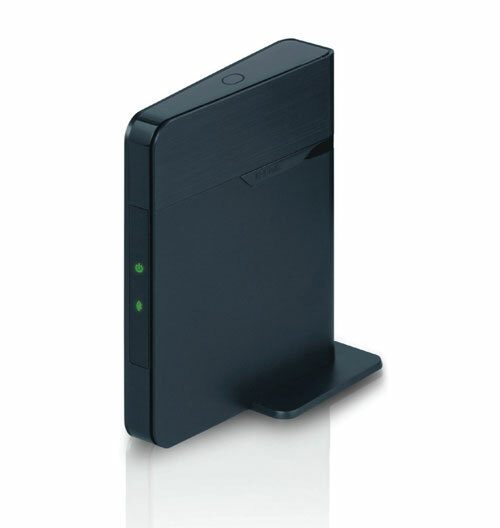 Featuring selectable dual-band to offer flexibility on how to best connect to the home network, the DAP-1513 can bridge a wireless signal from either a 2.4GHz or 5GHz network. Consumers can choose from the 5GHz band, ensuring smooth video streaming or online gaming with less interference, or the 2.4GHz band, ideal for surfing the Web or sharing photos. In addition, Intelligent Quality of Service (QoS) automatically organizes and prioritizes network traffic according to bandwidth needs to ensure a smooth connection over both wired and wireless networks. The DAP-1513 Wireless N Dual Band MediaBridge is now available for an MSRP of $119.99 (U.S.) and $99.99 (Canada) throughout D-Link’s vast network of retail and e-tail outlets in North America, including Fry’s and Micro Center, and at the company’s online store, http://www.dlinkshop.com. D-Link is the global leader in connectivity for home, small business, mid- to large-sized enterprise environments, and service providers. An award-winning designer, developer, and manufacturer, D-Link implements and supports unified network solutions that integrate capabilities in switching, wireless, broadband, storage, IP Surveillance, and cloud-based network management. For more information visit www.dlink.com, www.dlink.ca or connect with D-Link on Facebook (www.facebook.com/dlink) and Twitter (www.twitter.com/dlink). Good question. I don’t have one in hand so no way to confirm. The tricky thing is this whole “1080p” nonsense that gets advertised. 1080p means nothing. I can encode something to a low bitrate, make it 1920×1080, and claim I can play all my 1080p files anywhere. What matters is bitrate, which a 1:1 Blu Ray rip would be the most taxing to try and play over wireless (or more importantly to be able to sustain the stream). I would think that the best option to have any sort of success would be to make sure both the router and bridge are wireless N and on the 5GHz band. Even then of course there is no guarantee as there may be a lot of other variables involved that could affect wireless performance. I found the best option (IMO) based on cost/speed/easiness of setup is the Netgear WNDR3300 which also run at 5GHz and the speeds max out at about 6-8MB/s (for me) which can stream most things (maximum size video I managed to stream was a 12GB MKV, about 90 minutes in length) but I am sure it would stutter with a full blu-ray rip. My math says around 30GB maximum file size for a 90 minute movie. I bought 2 of them and they basically connect to each other by using the “Wireless Repeating Function” option. Easy to set up, speeds are great from my HP MSS (office) to my WDTV Live (living room) and I have 4 100mbit ports on each device. They run about $40 each on newegg (http://www.newegg.com/Product/Product.aspx?Item=N82E16833122273). Granted this isn’t the fastest option but a good solution to hook up two rooms in the house wirelessly. The rooms are next to each other, the devices are about 10-15 yards apart split by a drywall to give you an idea of the area. Interesting, thanks for sharing. When it comes to wireless I always suggest that you keep modest expectations. There is no reason why you shouldn’t be able to stream DVDs, but for a large majority of people being able to stream full lossless BluRays just isn’t going to happen consistently over wireless. Powerline and/or MoCA seem like it is also hit or miss, and can get pricey. I have set up MoCA in my home to provide networking through a switch to my Sammy TV, BD player, Wii and SageTV HD300 extender in my living room. I rip my BluRays to MKV H264 at 12MB/s (files end up being around 20GB) and they look great and play just fine. The MoCAs have been great. I tried powerline but the speed was not consistent. I am getting ready to stand up another MoCA connection upstairs to another HD300 and will try doing multiple streams at once. Thanks for sharing. I have been wanting to test MoCA but just haven’t had a chance to look in to yet. I don’t encode any of my BluRays so that would be my only concern, MoCA choking on the higher bitrate content (lossless BluRays can go easily over 30-35 MB/s). I will have to try a lossless version to test. I stopped ripping lossless since my encodes do not show any difference to anybody who watches my setup and I finally solved my subtitle issue.